Canada will now supply Uranium to India for its Nuclear Power Plants as the Cameco Corporation will supply 3,000 metric tonnes of uranium over five years to India at an estimated cost of 254 million USD and the supply will start from this year. Canada is the third country to supply uranium to India after Russia and Kazakhstan. The supplies will be under the International Atomic Energy Agency safeguards. Prime Minister Narendra Modi and Canadian Prime Minister Stephen Harper announced resumption of supply of fuel to India and declared their common intent to tackle the challenge of global terror. The signing of agreements announced a new chapter in Indo-Canadian relationship as the two countries left behind the past and rose to the occasion and announced the nuclear deal. Prime Minister Stephen Harper said Canada has what India Needs and announced his countries decision to resume supply to India. On his part, the Prime Minister Narendra Modi said that the deal represents the confidence that the two countries share. PM Modi also spoke on the urgent need to tackle the menace of terror together and underlined the importance of coordinated approach to tackle this global challenge. Canada used to supply Uranium to India prior to 1970, but stopped it after pokhran tests. Now, with signing of the agreements, signals a new era in the bilateral relations between the two countries. 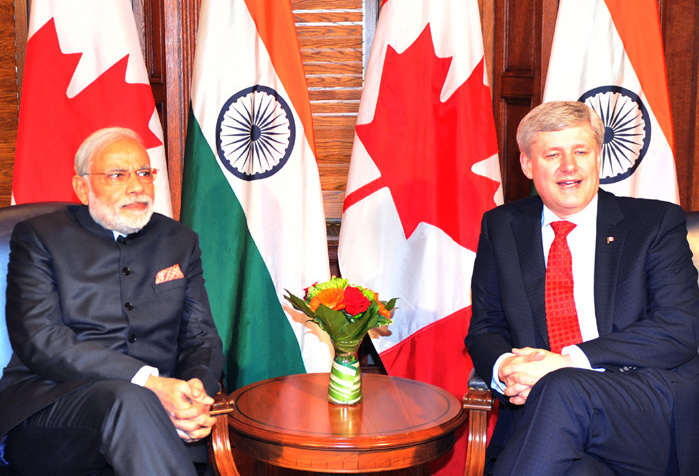 Prime Minister Stephen Harper said that this visit indicates the strong friendship between Canada and India.Harper spoke of the growing relationship between the two countries especially the enormous Trade potential.